Here at Buffer HQ, we had our heads focused on baking the next hot thing for you. And we now have it ready. Fresh out of the oven, Buffer for Facebook is now available for everyone. Buffer for Facebook has been the top requested feature and we were keen to give it the looks and functionality it deserves for you to use it. Little things and attention to detail with picture and thumbnail preview as well as editing of summary and the full word count were key. Largely developed and designed by our Chief Hacker Tom (you can give him a shout @TomMoor) we are excited to unveil this for you today. In the same way as Tweets, Buffer now allows you to add Facebook updates to your queue. We will then go ahead, schedule and publish this update for you, at the right time and well spaced out over the day. Get started and grab a free Buffer for Facebook account. You can now post the same update to both Facebook and Twitter OR have them posted to either network only – just click on your face to toggle! We have also reduced clutter on the dashboard to let you focus on writing great content for your followers. From there, you can also get extra space in your Buffer for free, by inviting your friends. We have also given our browser extensions (Chrome, Safari, Firefox) and dashboard a complete redesign and added some functionality. If you toggle your Facebook Buffer, it will automatically pull in the picture and preview. We tried make it look and feel nearly the same as if you would post to Facebook.com. You can browse through the pictures, edit the summary text of the preview or insert another link manually. We have also given your dashboard a complete redesign. We wanted to focus particularly on simplicity and elegance, so you get a better overview of all the Tweets that have been posted. We also brought the link shortening functionality back right at your dashboard, as well as on your browser extensions. 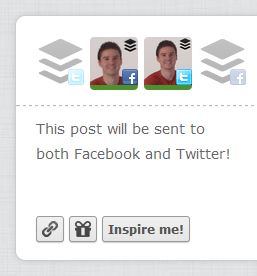 As a last goodie, you can invite your friends with the “gift” icon to get more space in your Buffer for free. Like many of you, we are waiting eagerly for the Google+ API to be ready, so we can expand the Buffer experience to Google+, LinkedIn and other services. What do you think of the new Facebook product and features? We would love to hear any thoughts you have on it and.